Sometimes a man’s desire may not be what’s best. 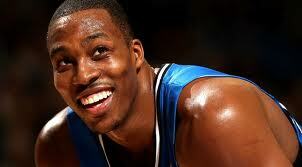 Dwight Howard has a well-documented desire to play with the soon-to-be Brooklyn Nets and star point guard Deron Williams. But the best fit for the NBA’s best center is probably an hour and a half south of New York: in Philadelphia. Those first place, defense playing Philadelphia 76ers. The Sixers have all the ingredients of a contending team except a superstar. Kind of like a birthday party without a cake. Could be good, but incomplete. The Sixers are at the top of every defensive statistic and Howard is the NBA’s best defender. The supporting cast has good perimeter defenders, an up-and-coming point guard, the league’s best bench, and solid passers to get Dwight the ball wherever he wants it. Howard would bolster the team’s already potent fast break, whether it’s from his blocked shots or firing outlet passes after pulling down one of his 20 rebounds. Big market? No problem. Philly boasts the 4th largest media market in the US with several major newspapers and a metropolitan area that covers three states. Plus, he would still be only 90 minutes from Madison Avenue. Add in the passion and intensity of the fan base and Philadelphia would fit him like a glove. Let’s face it, Brooklyn may be in the New York city limits, but it’s not Manhattan. There hasn’t been a major sports team in the borough since the 1950s and with most of the population Knicks fans, who knows how the Nets will be received. In Philadelphia he’d be following in the footsteps of Wilt Chamberlain and Moses Malone, a far cry from Net greats Shawn Bradley and Jayson Williams. Couldn’t you just see a Dwight Howard flavored Tastycake or him running up the steps of the Philadelphia Art Museum ala Rocky Balboa? Well one thing’s for sure, if Howard ends up in Philly the cake will definitely be at the party. The Philadelphia 76ers raced to a sizzling 18-7 start to the season, claiming Atlantic division supremacy in the process. But a recent 1-6 slide has cooled down the thought that this team is ready to contend for an NBA championship. However, the Sixers do have the potential to challenge for a berth in the Conference finals, but they have to get back to playing the style of ball that got them to first place. Here are some keys that may get them back to their winning ways. The Sixers were lauded for playing stellar perimeter defense, particularly from the 3 point line, in the season’s opening months. 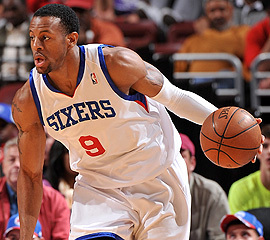 Led by All-Star Andre Iguodala, the team has held opponents to 31.6% shooting from 3 point land. But during their recent 1-6 slide, they are allowing an average of two more 3 pointers made per game. That’s an extra six points per game that could have reversed narrow losses against Houston, Minnesota, and Oklahoma City. The players have to do a much better job fighting through screens and getting their hands in the faces of shooters. The coaches have to do a better job at identifying the best personnel to negate open perimeter shots, which leads me to my next point. I know, I know. Challenging anything Doug Collins is doing is almost sacrilege. But there have been times where he has sent head-scratching lineups on the floor in crunch time. During the loss at Houston last week, Collins used his best perimeter defenders, Iguodala and Evan Turner, to hold the sharpshooting Kevin Martin to 6 points through 3 quarters. With the Sixers clinging to a slim lead in the waning minutes, Collin re-inserts Jodie Meeks into the game. 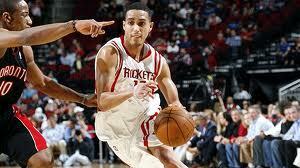 Martin proceeded to hit three straight 3 pointers over Meeks to help the Rockets get the win. Collins probably made the switch because Meeks had his offensive game going, but that portion of the game required defensive stops. Defense is the team’s strength and going forward, especially when clinging to a late lead, substitution have to be made with that in mind. With Spencer Hawes down and playing two rookies and two AARP members in the frontcourt rotation, the Sixers struggle getting points at the rim. But that’s no excuse for the often lack of aggression and assertion by the perimeter players. This team falls in love with jump shots and refuses to put pressure on the opposing defense by attacking the basket on a consistent basis. This team is dead last in the NBA by only getting 23.9% of their points at the rim. The league average is 30.1% and teams like Chicago, Denver and Miami. They’re also dead last points from free throws at 14.4%, including just 13.8% in home games. These two stats go hand-in-hand. Attacking the rim provides high percentage shots and more free throw attempts. 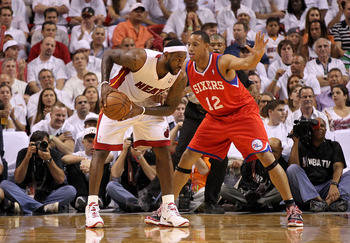 The Sixers have the athletic ball handlers to take defenders to the hole. Why they refuse to do more of it is not only intriguing, but has become detrimental. Doing these things may not bring a parade down Broad St., but their ability will be maximized which will translate into wins. Hell, if all else fails they could always trade for James Harden, amnesty Elton Brand and sign Dwight Howard this offseason. We can dream, can’t we? We all know boxers get paid for selling noise outside of the ring, but Floyd Mayweather’s recent comments on New York Knick sensation Jeremy Lin is downright trash. 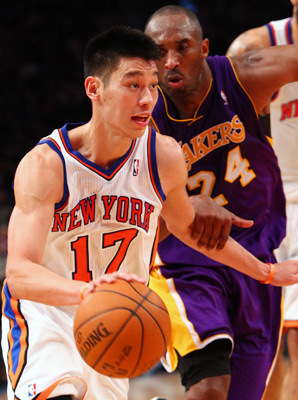 Anyone paying attention to the story knows that Lin is doing something no one has ever done in the history of the NBA. And yes, that includes black players. Lin is the only player to score at least 20 points and have at least 7 assists in his first 4 starts in league history. He also has scored 109 points over that span which is the most scored to start a career since the merger. 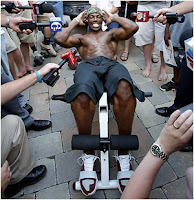 So is publicity for a guy making history now called overhype? No, Floyd just tends to over talk. Do us all a favor Floyd. 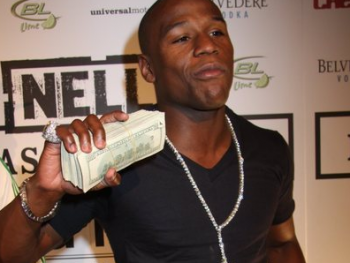 When you start flaunting wads of cash to display narcissism as only you can, just grab a fist full and stuff some in your mouth. Or maybe we’ll just ask Manny to. Chris Paul should be a Laker. But will he? At about 6:30pm EST the Los Angeles Lakers seemed to have acquired New Orleans Hornets star Chris Paul in a three team trade. What seemed like a done deal didn’t even last three hours. 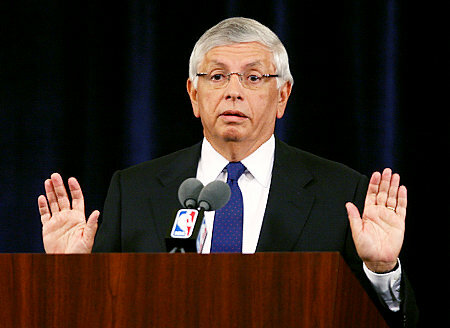 By 9:00pm NBA commissioner David Stern vetoed the trade following the outcry of league owners. The owners felt like allowing Paul to choose a trade destination is the essence of what went wrong in league structure over the last year and a half. They feel that small market teams need to keep their marquee players to create and maintain a league-wide competitive balance. If that’s the case, wouldn’t it make sense for New Orleans to get a ransom for Paul rather than risking the team getting “LeBroned?” This isn’t Pau Gasol for Kwame Brown here. The Hornets were set to get three all star caliber talents for the price of one superstar. That’s even better than what the Nuggets received from the Knicks in the Carmelo Anthony deal, and we thought they gave away a fortune. The Hornets would have been able to put a line up together that included Kevin Martin, Lamar Odom, Luis Scola and Emeka Okafor. Not too shabby considering your trading just one player, albeit the league’s best point guard. David Stern has ruled this league with an iron fist for far too long. He levied a league dress code, he added an age limit upon league entrance and now he vetoes a trade that not only saves the Hornets from getting nothing for Paul but also allows one of the league’s glamour franchises to be able to make more money in ticket sales, TV deals and merchandise for the entire league. Paul, although he doesn’t want to be a Hornet long-term, actually wants the franchise to get something for him rather than watching the team fade to abysmal status as Cleveland did after losing LeBron James. It’s time for Stern to realize that he is neither a king nor a dictator. He should only be concerned with what is truly best for the league. Adding another basement dwelling team sure isn’t. Awards given to players through the first third of the season. Rodgers has picked up where he left off in last year’s playoffs. He leads the league in QB rating (122.9), touchdown passes (14), and completion percentage (71.7). He is third in total passing yards and has the Packers at 5-0. Fred Jackson (RB, BUF) –Freddie has 712 yards from scrimmage, 480 rushing yards and 5 touchdowns for the 5-0 Bills. Tom Brady (QB, NE) – Tom is still terrific with 1,874 yards, 14 touchdowns, and a 101.4 QB rating. Matthew Stafford (QB, DET) – A Lion’s QB up for MVP? I guess when you have 1,436 yard and 14 touchdowns in 5 games the consideration is warranted. 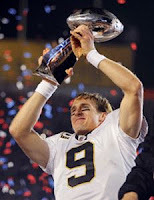 Drew Brees (QB, NO) – His number are typical Drew Brees threw 5 games; 1,769 yards, 12 touchdowns, and a 102.3 rating. 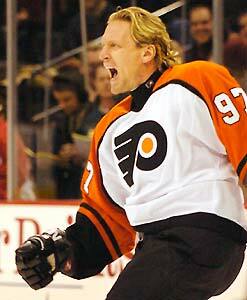 Perennial MVP candidate. Allen has been dominating and flat-out unblockable thus far. He is not only sacking QBs, he is playing a little pass defense as well. Through the first third of the season, Allen leads the NFL with 8.5 sacks and has 4 passes defended, 1 interception, a forced fumble and a fumble recovery. He’s been the best on the defensive side of the ball so far. George Wilson (SS, BUF) – Wilson is third in the league in total tackles (47) and has a league leading 3 interceptions for the Bills. Morgan Burnett (SS, GB) – The Packer’s strong safety is tied for the league lead in interceptions (3) and has tallied 8 passes defended, a sack, a forced fumble and a fumble recovery. Carlos Rogers (CB, SF) – Rogers is tied for the league’s lead in both interceptions (3) and passes defended (10). He also has an interception returned for a touchdown. Jason Pierre-Paul (DE, NYG) – JPP is leading one of the league’s best defensive lines with 7.0 sacks (2nd in the league), 27 tackles, and a forced fumble. I know, I know, you were probably expecting Cam Newton. While Dalton hasn’t thrown for the yards that Newton has, he has just one less touchdown pass and one less interception thrown than the Carolina QB. 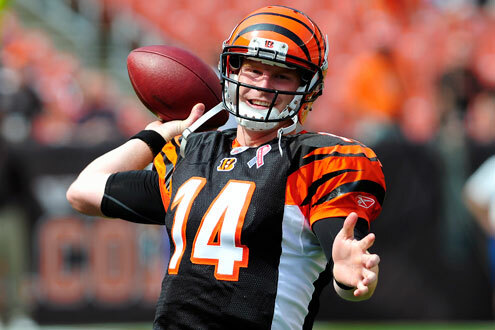 Dalton leads rookie passers in completion percentage (59.2%) and wins (3). He has a team with fewer weapons than almost any other in second place in the AFC North. Cam Newton (QB, CAR) – The 2011 number 1 pick leads all rookie passers with 1,610 yards, 7 touchdown passes and a rating of 84.3. Julio Jones (WR, ATL) – Jones leads all rookies with 25 catches and is second with 358 yards. Von Miller has completely lived up to his hype so far. 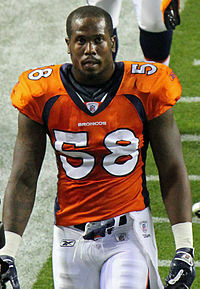 The second overall pick in the 2011 draft has been a bright spot in the Broncos’ dark start. He leads all rookies with 5.0 sacks and 2 forced fumbles. The sky is the limit for this guy. Aldon Smith (OLB/DE, SF) – The 49ers rookie is second among rookies with 3.5 sacks. Patrick Peterson (CB, AZ) – The rookie has tallied one interception to go along with a punt returned for a touchdown. This was a close one between Stafford and Alex Smith. Ultimately, superior numbers and one more gives Stafford the nod. Stafford has finally given the Lions’ fans something to roar about. After a terrible injury cut his season to just 3 games in 2010, Stafford has rebounded to be an MVP candidate. He has thrown for 1,436 yard, 14 touchdowns, and has a QB rating of 101.4. More importantly, he has his Lions 5-0 for the first time in 50 years. Alex Smith (QB, SF) – Jim Harbaugh has the former number 1 overall pick finally playing winning football after years of futility. Smith ranks sixth in NFL in completion percentage (65.9%) and fourth in passer rating (104.1). Steve Smith (WR, CAR) – Smith has rebounded from injuries, inconsistency, and spotty QB play and has returned to Pro Bowl form. Smith leads the league in yards per catch (22.6) and is second in receiving yards (609). Jason Pierre-Paul (DE, NYG) – JPP has finally started to play up to his first round selection. He has 7.0 sacks and force fumble through 5 games, besting his entire 2010 season output. 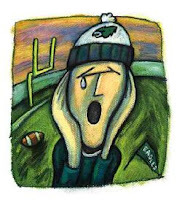 Tough year for Eagles fans. Well, now I guess we can say that the proverbial sky has fallen over Lincoln Financial Field. The Philadelphia Eagles have sputtered out of the gate to a 1-4 record, vastly falling short of preseason expectations. The team’s dysfunction is not just limited to the playing field. The fans are calling for the firing of coaches and guys in the locker room are questioning the intestinal fortitude of fellow teammates. Should the team's start be a complete surprise? Maybe not. How many times have we seen franchises collect super talent in the offseason and not get immediate results on the field, court, or diamond? The Eagles committed millions to Cullen Jenkins, Jason Babin, Vince Young, and the prize of free agency Nnamdi Asomughua. All of those guys were former Pro Bowlers, and even one is a Super Bowl Champ. I guess the Eagles didn’t think about continuity, camaraderie, and team chemistry when they dished out those big contracts. It’s baffling to see franchises go on wild spending sprees in free agency and expect the team to immediately win when history has always shown the total opposite. 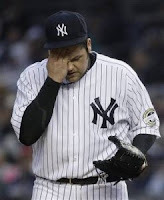 The Yankees have always been big free agency spenders but have only won one World Series titles since 2001. The Redskins of the 1990s popularized big spending and bigger losing in the NFL. Last season saw the Miami Heat sign 3 top 20 players and fall short of a title. And this list goes on and on. Spending big just masks weaknesses that are unveiled in big moments. No one knew the Heat lacked good point guard play and interior defense until the NBA Finals. In the same way, no one was talking about the Eagles' poor talent at linebacker, an inadequate offensive line, and the head scratching move of switching the offensive line coach to defensive coordinator. This Eagles team was flawed from the beginning. They strengthened areas where they were already strong and completely ignored their major areas of concern. The “dream team” label was only added pressure. 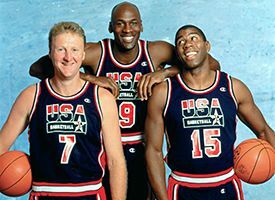 Especially since the only Dream Team consisted of all time greats like Jordan, Magic, and Bird. This team is just a bunch of birds with no magic. Surprise! Who knew Kurt Warner would rank this high on the list? At first glance, you wouldn’t put Warner over Aikman or Marino. But when you look at the numbers, they scream Hall of Fame. Kurt Warner has been an MVP twice, a Super Bowl Champion, Super Bowl MVP, and first team All Pro twice. He retired second all time with a 65.5% completion percentage and second all time 93.7 career passer rating, both better than the aforementioned Hall of Famers. But perhaps his greatest accomplishment was leading the hapless Ram and Cardinal franchises to Super Bowls. For that alone he should be on this list. Warner went from bagging groceries to the Super Bowl in a matter of months. A devout Christian and community activist, Warner is living proof that nice guys don’t always finish last. You didn’t think Peyton Manning would be left out did you? Manning walked into the worst franchise in the NFL in 1998 and changed the fortunes of the Colts forever. 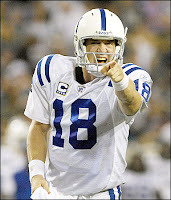 After a 3-13 rookie year, Manning led the Colts to 13-3 the next season and they haven’t had a losing season since. Peyton plays the position like General Patton. He barks plays at his troops and meticulously attacks the opposition with tenacity; firing bullets up and down the field with precision. His stats are straight up ridiculous. He’s thrown for 54,000 yards, 399 touchdowns and he’s been named All Pro 5 times. Cap those numbers with a Super Bowl win and we’re talking about a guy on the Mt. Rushmore of quarterbacks. I don’t know if there is any quarterback that works harder at the position as Manning. His record 4, yes 4, MVP trophies are proof of that. 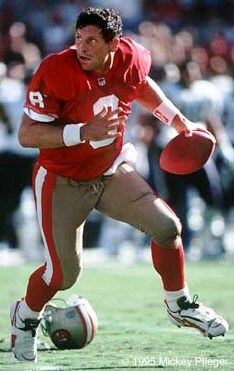 Steve Young was one of the most physically gifted athletes to ever play in the NFL. The dude was 6’2, 215 lbs, had 4.5 speed, pin-point accuracy and had the intelligence of a lawyer. After playing in quarterback purgatory, coaching legend Bill Walsh traded his second and fourth-round draft choices to Tampa for Young. The Bucs got Vinny Testaverde and more years of losing while the 49ers got a Hall of Famer. When he finally got his time to start in San Francisco, he never looked back. He won a record 6 passing titles, 2 league MVPs, and 3 first team All Pro selections. He played big in the NFL’s biggest game throwing a record 6 touchdowns and earning the MVP award in his Super Bowl victory over the San Diego Chargers. The guy would do anything to get a victory. If it meant throwing the winning touchdown pass or running threw a linebacker for a first down, Young did it. Young threw and ran his way through the NFL record books. 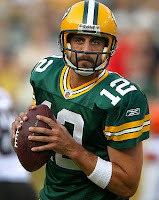 He retired with the highest quarterback rating in NFL history and a quarterback record 43 rushing touchdowns. Young was the most versatile quarterback to ever play the game. To know how good he was just think about this. The Niners sent the great Joe Montana to Kansas City in Young's favor and the team didn’t miss a beat. Nuff said. Floyd Mayweather v Victor Ortiz quickly became the undercard for Mayweather v Merchant. 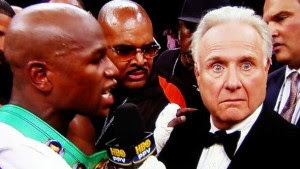 During the post-fight interview, HBO’s Larry Merchant repeatedly asked Mayweather questions about his polarizing knockout of Ortiz. How fitting for Troy to land at number 8 on my list. The golden boy starred for UCLA before being the number 1 overall pick of the Dallas Cowboys in 1989. After posting a 0-11 record in his rookie season, Aikman won 90 games and 3 Super Bowls in the decade of the 1990s. Aikman’s 3 titles, which includes a game MVP, set him in exclusive company. Only 2 quarterbacks have won more. Surprisingly, Troy has very average stats, throwing just 165 touchdown passes compared to 141 interceptions. All in all, Troy was a winner whose leadership cannot be told by sheer numbers. Unless those numbers are 3, the number of titles he brought to Dallas. No one did so much with so little as John Elway. This guy carried 3 different Denver Bronco teams to the Super Bowl when they had no business being there. A true clutch performer, Elway has 46 game winning drives on his resume. He guided the Denver Broncos to 148 wins with his 50,000 passing yards during his 16-year career. 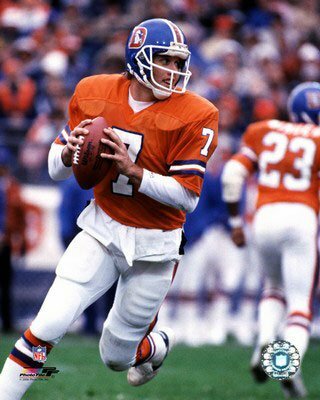 Elway’s rifle arm led him to 399 career touchdown passes. On the other hand, that arm also produced 226 interceptions and a very mediocre 56.9% completion percentage. But I don’t remember him for his miscues. I remember him closing out his career with back-to-back Super Bowl wins. Talk about going out in style. 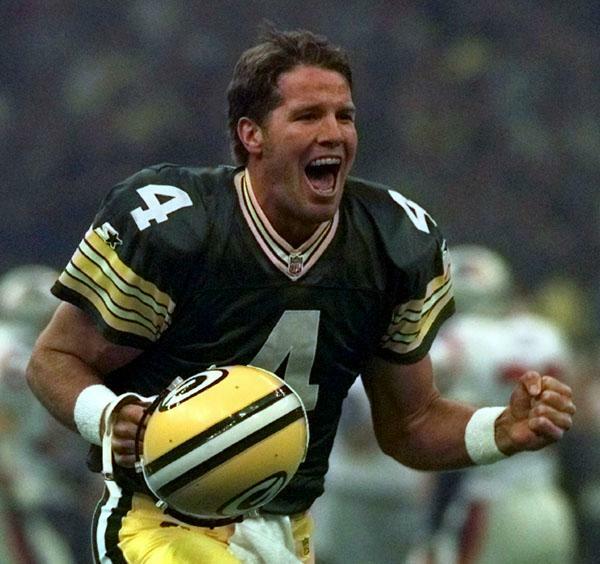 I’m not one of those guys who has a man crush on Favre. What no one can deny is that for 20 seasons no one played with the combination of toughness, exuberance, and joy quite like Favre did. He literally rewrote the record books and was as revered across the NFL as any other player in league history. Favre retired with the most passing yards, completions, and touchdowns in league history. He also retired with the most interceptions (336) and, for all his success, just a 7-11 record in the postseason. His multiple retiring and un-retiring routines are well documented, but the guy deserves his props for winning 3 MVPs and playing sport’s toughest position for 298 straight games. That’s gangsta. 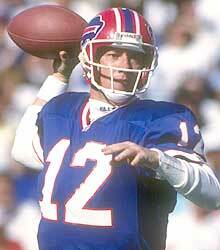 For 11 years Jim Kelly ran the K-Gun offense to perfection for the Buffalo Bills. The Hall of Fame quarterback led the Bills to 8 playoff appearances including 4 straight trips to the Super Bowl. 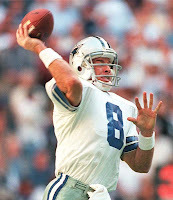 Kelly threw an impressive 237 touchdowns passes in his career, including his league leading 33 in 1991 when he was named to his only All Pro team. He would have had to win a couple of those Super Bowls to break into the top 10. Drafted by San Diego, Brees developed into a Pro Bowl quarterback before the Chargers let him walk due to injury. He signed with the Saints and brought a Super Bowl to the Katrina ravaged city of New Orleans. Brees put up big career numbers across the board with a 91.2 rating, 239 touchdown passes and a 65% completion percentage. Add a first team All Pro selection and a Super Bowl MVP award with those numbers and Brees is well on his way to a bust Canton. 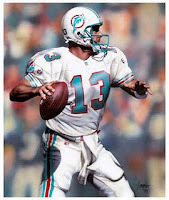 Now we are firmly into the upper echelon and who better to start with than Dan Marino. He set the world on fire in 1984 when he was league MVP, setting single records for touchdowns (48) and passing yards (5,084). With his quick release, Marino retired holding every major career passing record. His play earned him a first ballot Hall of Fame selection. Unfortunately, Marino was never able to have the same success in the postseason. He had just a 5-10 playoff record after winning 147 games in the regular season. The biggest blemish on his resume` is his lack of a Super Bowl title, but still Dan Marino was truly an all time great and deserves this top 10 spot on my list.